"Bialik Appeal", possibly published in The Jewish News, 31 October 1969. 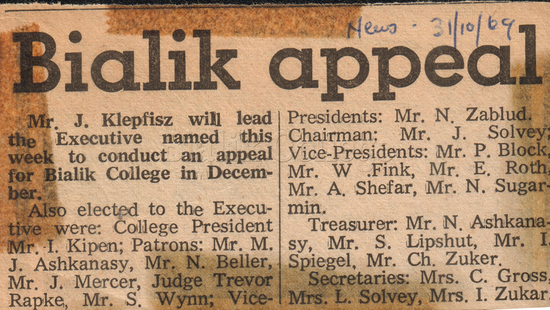 The newspaper clipping states: " 'Bialik Appeal' Mr. J. Klepfisz will lead the Executive named this week to conduct an appeal for Bialik College in December. Also elected to the Executive were: College President Mr. I. Kipen; Patrons: Mr. M. J. Ashkanasy, Mr. N. Beller, Mr. J. Mercer, Judge Trevor Rapke, Mr. S. Wynn, Vice-Presidents: Mr. N. Zablud. Chairman: Mr. J. Solvey; Vice-Presidents: Mr. P. Block, Mr. W. Fink, Mr. E. Roth, Mr. A. Shefar, Mr. N. Sugarmin. Treasurer: Mr. N. Ashkanasy, Mr. S. Lipshut, Mr. I Spiegel, Mr. Chu. Zuker. Secretaries: Mrs. C. Gross, Mrs. L. Solvey, Mrs. I Zukar." Article from The Australian Jewish Herald, 'Seder held at Bialik College', 24 April 1964. Please contact archives@bialik.vic.edu.au to request access to this record. Jigsaw puzzle for Joseph and the Amazing Technicolour Dreamcoat musical, 1995. Please contact archives@bialik.vic.edu.au to request access to this record. Booklets created by kinder classes featuring the memories of their grandparents, 2007, 2013 and 2017. Students wearing leis standing in a classroom alongside a teacher and school principal Moshe Moretz, c. 1960s. Please contact archives@bialik.vic.edu.au to request access to this record. Teacher and parent music workshop, Shakespeare Grove, late 1990s. Please contact archives@bialik.vic.edu.au to request access to this record. Bialik football team with coach, 1978. Please contact archives@bialik.vic.edu.au to request access to this record. Newspaper clipping announcing Bialik College's first Batmitzvah celebration, 1970. Year 7 students performing at the B'nei Mitzvah ceremony in 1994. Students on ski camp at Mount Hotham, July 1995. Certificate awarded to Bialik College for winning second place in a competition to create a film in celebration of 110 years of the Jewish National Fund of Australia, c. 2011. The film was made by two Bialik students, Jake Fehily and Max Korman, who went to Israel to present it. Invitation to the 'Montmartre Soiree', 7 June 1969 at the home of Mirte and Henry Sinclair, organised by the Bialik College Parents' Association. Invitation to the Bialik Ball, 19 August 1967 at the Chevron Hotel, Prahran. This was a fundraising event organised by the Bialik College Parents' Association. Includes a cartoon and poem. 'Loving to eat Jewish' is a chapter in a book titled 'Tried Tested and True' by Liz Harfull (Allen & Unwin, 2018), which tells the story behind the recipe book 'I Love to Eat Jewish', produced by a group of mothers of Bialik College students in 1968 to raise money for the school's building fund. Four photograph books: Bialik Rising Star 2013, Primary Musical ‘Go Noah’ 2012, Fiddler on the Roof 2013, Chavayah 2015-2016. Please contact archives@bialik.vic.edu.au to request access to this record. File of student work, reports, merit certificates, camp booklets (Weekaway). Includes staff display book containing student self-evaluations, c. 1990s. Please contact archives@bialik.vic.edu.au to request access to this record. File of documents relating to the history of Bialik College and its founders. Includes information about Joseph and Lily Solvey. Please contact archives@bialik.vic.edu.au to request access to this record. Booklet about the opening of the Rosenkranz Centre for Excellence in Achievement in Education at Bialik in 1997, in honour of Betty and Shmuel Rosenkranz. Please contact archives@bialik.vic.edu.au to request access to this record. Items relating to Jewish holidays, c. 2000s, including greeting cards, stickers, bookmarks for Rosh Hashanah, Purim, Chanukah Song and Dance Evening program, Pesach etc. Folder containing Bialik College constitution, 1979, as amended 1984, 1986 and 1996; Council Handbooks 2002, 2003, 2004, 2005, 2006, 2007; Key Values and Strategic Plan, 1997/1998. Please contact archives@bialik.vic.edu.au to request access to this record.